There is no doubt that we are becoming a society ruled by Facebook. An estimated 1 in 14 people hold an account with the powerful social networking site which has become an integral, often shameful, part of our lives – whether it be sharing every thought via a status update, organising social calendars, reconnecting with people from the past who would otherwise be long forgotten, or stalking a secret crush or arch nemesis. 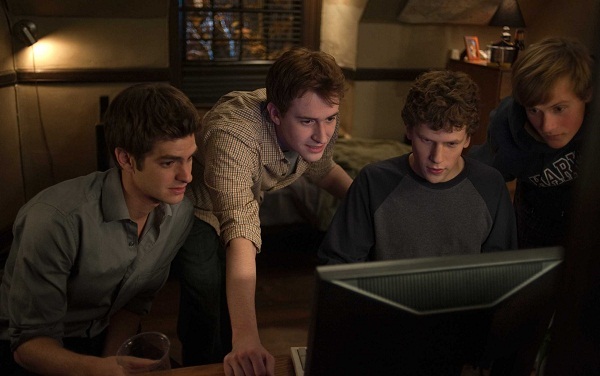 The Social Network brings the origin story of Facebook to the big screen under the masterful eye of revered auteur David Fincher, the brilliant director of Fight Club, Se7en, The Curious Case of Benjamin Button and Zodiac. The film arrives at a pertinent time: not only is Facebook growing exponentially, but the society it has so effectively infiltrated is beginning to question its morality and ethics. What started as a Harvard prank has spawned a multi-billion dollar empire. Mark Zuckerberg (Jesse Eisenberg) is a Harvard University student by day and skilled computer coder by night. After being dumped by his girlfriend Erica (Rooney Mara, future Lisbeth Salander in Fincher’s upcoming English-language version of the Millennium Trilogy) and drinking excessively in front of his computer, Zuckerberg decides to hack into the university databases, retrieve names and photos of students and set up a website where his peers can rate the attractiveness of the female population. Within hours (and 22,000 hits) the servers’ crash and Zuckerberg is being punished by the university board. At the same time, the wealthy Winklevoss twins (Armie Hammer) see Zuckerberg’s potential and approach him to develop a social networking site called Harvard Connection. An inspired Zuckerberg instead develops his own site, The Facebook, using his own code and the help of his best friend Eduardo Savarin (Andrew Garfield). As the website explodes in campuses across the country, Zuckerberg finds himself fighting several law suits and his friendships in jeopardy. Armie Hammer is superb as the Winklevoss twins, who accuse Zuckerberg of stealing their ideas. The film sees the combination of Fincher’s phenomenal directorial skills and Aaron Sorkin’s (The West Wing) clever writing. The result is an intelligent, socially relevant and highly engaging dramatisation of Ben Mezrich’s novel The Accidental Billionaires. 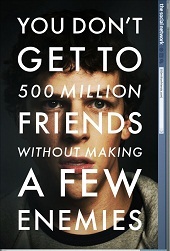 The fast-paced opening scene perfectly sets up the character of Zuckerberg – engrossingly portrayed by Eisenberg – and sets the tone of the film. At first it seems a strange way of introducing us to this story – sitting in a dark and dirty university bar. However, the overarching dichotomy of the film is faultlessly established here. The rise of Zuckerberg and Facebook is skilfully traced through an interweaving of plots, moving between Zuckerberg's efforts to build and grow the site and the legal battles that followed. On the one hand we revel in Zuckerberg’s unquestionable gift with words, while at the same time we shake our heads at his lack of social skills and air of cockiness which spiral out of control as the film progresses. Fincher’s directorial style is appropriately stripped back compared to many of his other films, but a rowing scene involving the Winklevoss twins and tilt-shift photography is a visual feast. Trent Reznor’s score is another significant ingredient in making the film come together. He uses pulsating, synthesised tones that drive the pace of the film just as much as the rapid editing techniques. I don’t think I’ve liked a film score this much since Karen O’s work on Where the Wild Thing Are. All the supporting players here are fantastic, particularly Armie Hammer as the Winklevoss twins, whose dual role was achieving in part through Fincher’s refreshingly seamless and naturalistic use of CGI (a’la Benjamin Button and Zodaic). His charisma and deft comedic timing makes for entertaining viewing when Fincher decides to give us a breather from Zuckerberg. It’s hard not to hate Napster-upstart Sean Parker (Justin Timberlake), who works his way into the fold, does little to build the company, and is then instrumental in the devastating fall of Eduardo. While specific details (Zuckerberg’s blog entries, what beer he’s drinking) are known to be factually correct, Sorkin and Fincher have openly admitted to have taken dramatic licence, so take what you will from The Social Network in forming an opinion on Facebook and its enigmatic creator. Regardless, this is possibly one of the best films of 2010 so far. 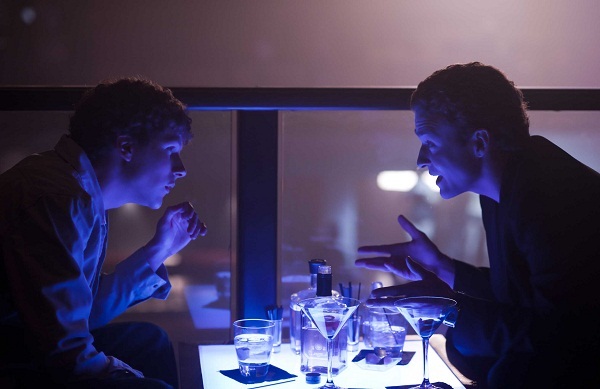 Fincher is able to depict the million dollar struggle between Zuckerberg and Savarin in a way that is relatable to the audience who, under all the legal jargon, are just two friends hurt by the disintegration of their friendship. I found myself struggling to pick a side. Is what Zuckerberg did wrong? Is he a bad person? Fincher leaves it all up in the air for you, as any well-constructed film should. Though it leaves you questioning the ethics and social impact of social media, there's no doubt you’ll be discussing it with friends on Facebook that very night.